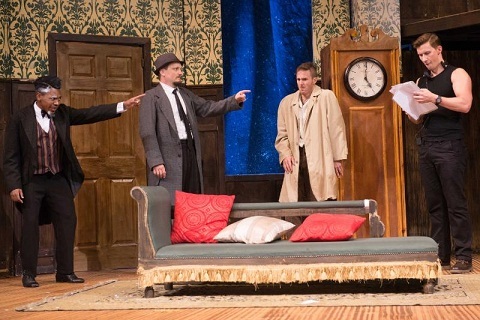 Thanks to Pieter Toerien for securing the rights for KickstArt to be able to present The Play That Goes Wrong in Durban and for hiring the company his – as director Steven Stead descries it - “ingenious and rather expensive set!” which is designed by Scene Visual Productions. Ingenious it certainly is and all kudos to the backstage crew – Clare Craighead, Chris Randall and Erina Rautenbach as well as to Greg King and Wendy Henstock who look after set refurbishment - for the huge amount of work that this production entails. As the title suggests, it requires things that go wrong – doors don’t open, floors tip, mantelpieces that refuse to stay up, a lift on its last legs and a revolving bookcase which has a mind of its own. Stead has chosen a stellar cast to handle this hilarious, clever, jet-propelled chaos. James Cuningham – good to see him back in Durban – astounds with his physical ability, particularly in a hysterically funny sequence where he fights furniture. Iain Robinson provides a terse calm in all the madness. Liesl Coppin and Daisy Spencer prove their stamina and agility despite constantly being knocked down. Michael Gritten is a highly amusing corpse. Bryan Hiles is a delight as always. Greyed and ageing, Mthokozisi Zulu, is a suitably doddery butler and Adam Dorè is casual and easy-going as the sound technician. The Play That Goes Wrong is all about a play within a play. Set in the 1920’s, it’s titled Murder at Haversham Manor and is being presented by the Berea Amateur Dramatic Society (BADS). The action takes place in the drawing room with its ornate wallpaper and fittings including an intercom system between this room and a study upstairs. This is where things get hectic because the “upstairs” is simply a small area that takes up a corner. For the actors, this requires nerves of steel! It is the evening of an engagement party. The happy – or as we discover, not-so-happy - couple are Sandra (Coppin) and Charles (Gritten). The scene opens to reveal Charles lying dead on the sofa. Thomas (Cuningham) who is Sandra’s brother, Perkins (Zulu) and Cecil, Jonathan’s brother (Hiles), discuss possible causes of his demise with Inspector Carter (Robinson). The dialogue is extremely funny with loads of melodramatic pauses. There is much humour when the stage manager, Annie, (Spencer) and the technician, Trevor (Dorè) have to take over from Sandra who has collapsed. There are some brilliant moments and the physical demands on the cast are considerable. Crazy develops to insane then manic and absolute mayhem. This is a real danger zone. If you think you’ve seen it all, stand by. The final moment is mind-blowing! The Play That Goes Wrong runs until April 29. Ticket R180 to R230. Shows are 19h30 nightly from Tuesday to Saturday, and 14h30 on Saturday, and 16h00 on Sunday. Booking is at Computicket.